Situated 1.3 km from Dolmabahce Palace and featuring a terrace, Sunrise Istanbul Suites offers accommodation in Istanbul. Free WiFi is offered. The apartment offers a flat-screen TV and a private bathroom with free toiletries, a hair dryer and shower. Guests at Sunrise Istanbul Suites can enjoy a halal breakfast. A car rental service is available at the accommodation. 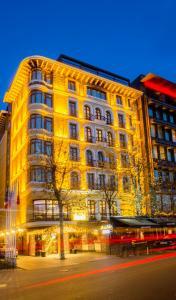 City's Nisantasi is 2.6 km from Sunrise Istanbul Suites, while Dolmabahce Clock Tower is 2.9 km away. The nearest airport is Istanbul Ataturk Airport, 24 km from the apartment. When would you like to stay at Sunrise Istanbul Suites ? This studio features a view, kitchenette and cable TV. This studio features a electric kettle, view and tile/marble floor. This studio has a cable TV, air conditioning and electric kettle. This studio has a minibar, cable TV and view. This studio has a bathrobe, tile/marble floor and air conditioning. This studio features a electric kettle, tile/marble floor and bathrobe. This studio features a bathrobe, cable TV and air conditioning. This studio has a satellite TV, bathrobe and electric kettle. Please inform Sunrise Istanbul Suites in advance of your expected arrival time. You can use the Special Requests box when booking, or contact the property directly with the contact details provided in your confirmation. Each day we'll check prices and send you an email for your selected dates at Sunrise Istanbul Suites. If you don't have specific dates but would like to check prices for say next weekend or say next month we can check the price too. Click to write a review and share your experience of Sunrise Istanbul Suites with other travellers.